Arrangement: Arranged chronologically in six series: I. 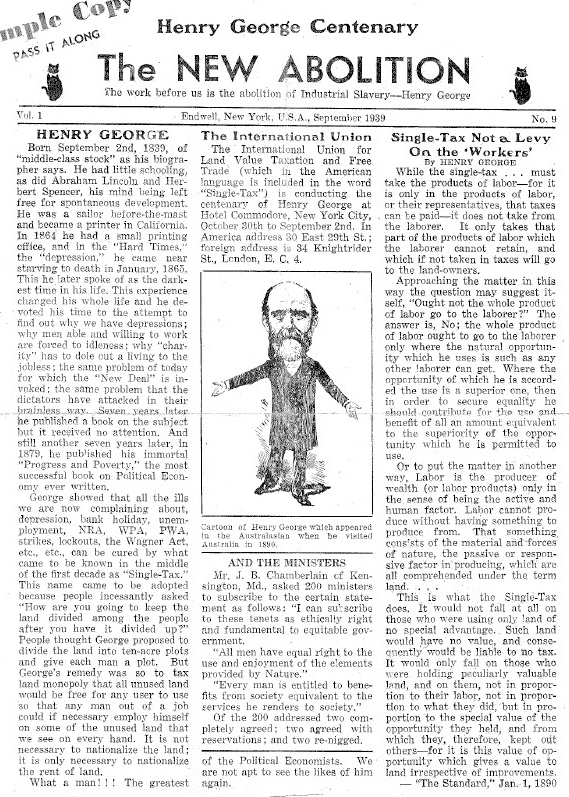 Material from the Centenary Celebration of Henry George’s Birth, September 2, 1939; II. Material from the Seventy-Fifth Anniversary Celebration of Progress and Poverty, 1954; III. Material from the Centennial Celebration of Progress and Poverty, 1979; IV. 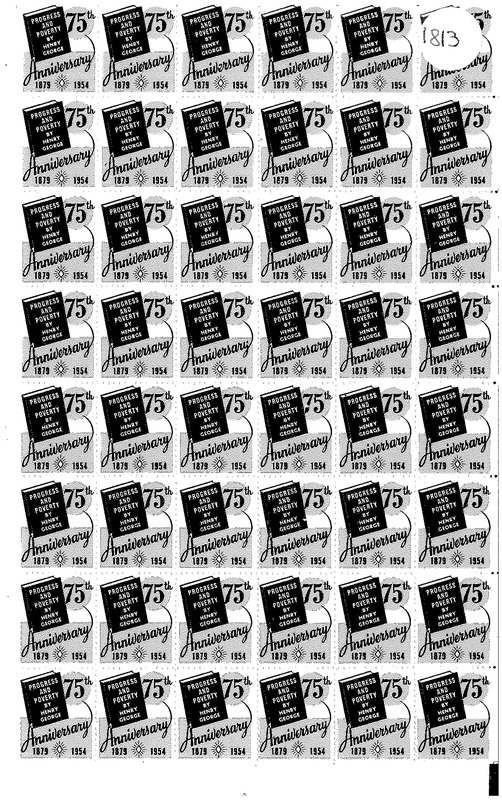 Material from the Sesquicentennial of Henry George’s Birth, September 2, 1989; V. Material from other Anniversary Celebrations of Henry George and Progress and Poverty; and, VI. 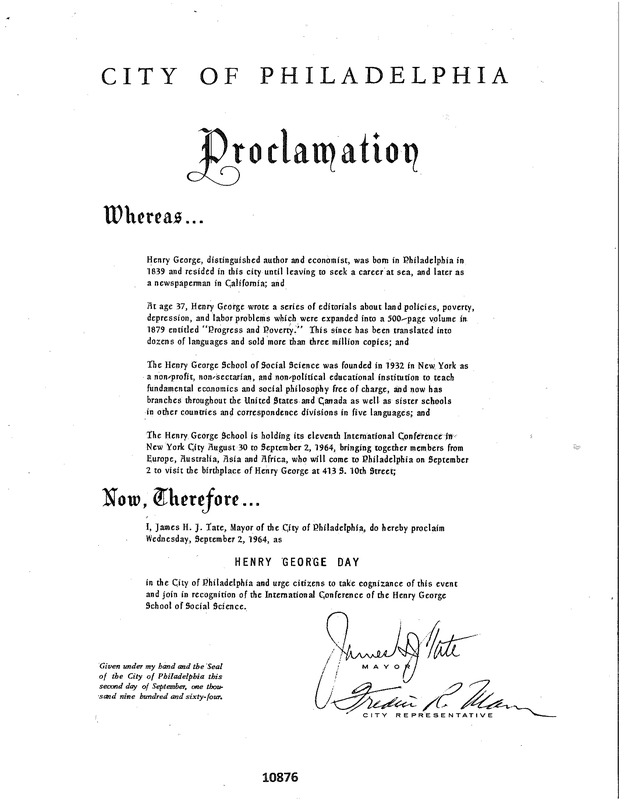 State, County, and City Henry George Day Proclamations. 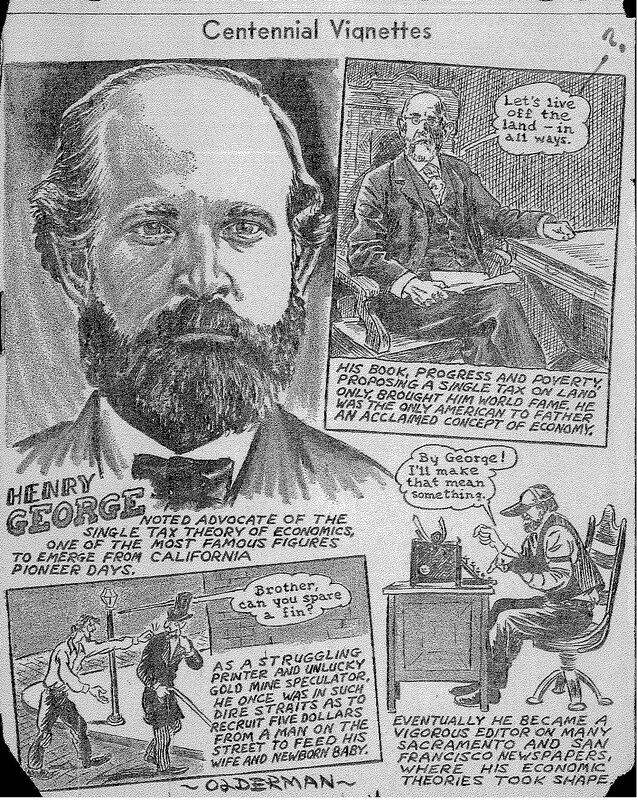 Since the death of Henry George in October of 1897, Georgists around the world have hosted celebrations and meetings to honor the anniversary of his birth and the publication of his masterpiece, Progress and Poverty. Among the most widely attended and publicized include the centennial celebrations of Henry George’s birth in 1939 and the publication of Progress and Poverty in 1979. Georgists organized international conferences—in New York City and San Francisco, respectively—to honor both occasions. For the celebration of the 100th anniversary of George’s birth, Georgists from around the world gathered at the Commodore Hotel in New York City where they presented papers on and discussed a variety of issues including the progress and effects of land value taxation around the world. Fifteen years later, Georgists celebrated the 75th anniversary of the publication of Progress and Poverty in 1954. A special postage stamp was created and the Library of Congress in Washington D.C. organized a special exhibit to honor the occasion. 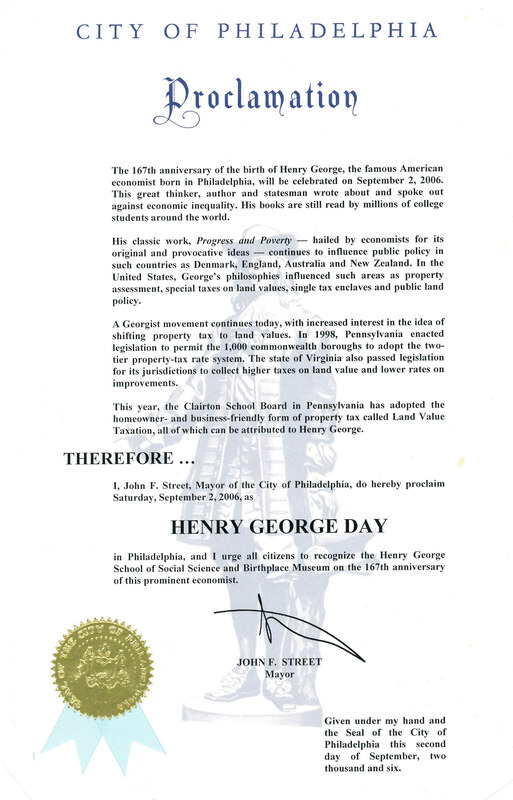 Sometime during the early 1950s, Georgists around the country began asking local governmental leaders to recognize “Henry George Day” with official proclamations. Series Six of this collection contains dozens of the proclamations issued by city, county, and state leaders. 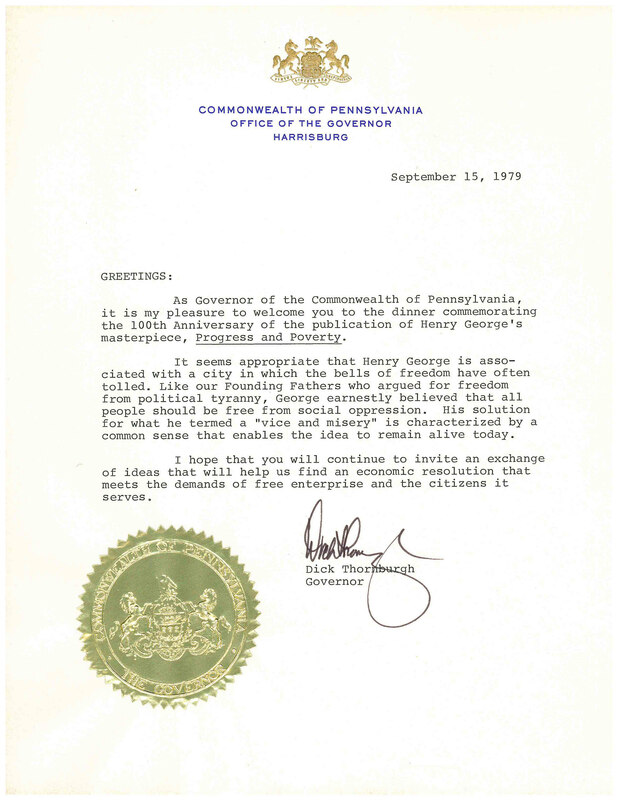 Planning for the centennial celebration of Progress and Poverty began as early as 1974 and included the creation of a Centennial Celebration Committee. George’s granddaughter, Agnes George de Mille served as Honorary Chairwoman while Terry Newland, executive director of Land Equality and Freedom (LEAF), chaired the committee. Several groups sponsored the event including the Henry George School of Social Science, the Henry George Institute, the Henry George Foundation, and the Robert Schalkenbach Foundation. The Centennial Celebration of Progress and Poverty took place at the Jack Tar Hotel in San Francisco from August 20-25, 1979. More than 300 people participated in the week-long event which included speeches, discussions, and special events. Paul Nix, President of the Henry George School gave the opening address. The Robert Schalkenbach Foundation published a special anniversary edition of Progress and Poverty that included special tributes to Henry George by a wide-variety of prominent thinkers and social leaders. Ten years after the centennial celebration of Progress and Poverty, an international conference was organized in Philadelphia to commemorate the Sesquicentennial anniversary of George’s birth. Some of the conference events took place at the newly restored Henry George Birthplace at 413 South 10th Street.